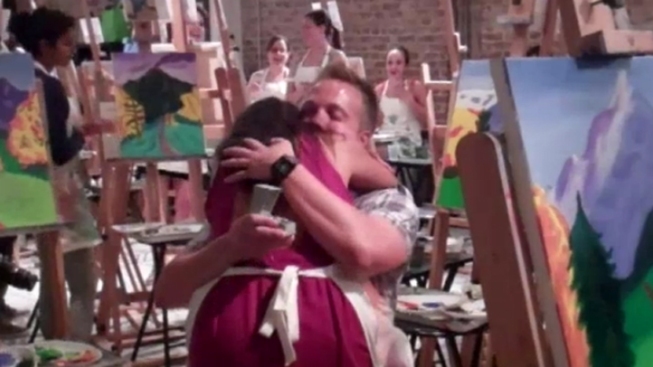 Tim Bower and Michelle Rivera had signed up a painting class at the LivingSocial venue downtown -- but in addition to paints, brushes and canvases, there was something else waiting for them there. Bower had arranged for an instructor to paint, "Micha, Will You Marry Me?" on his canvas. He then called Rivera over to see it, and got down on one knee. Yep, all while their classmates continued swirling paint on their canvasses (or -- let's be honest -- while they looked on). To help them kick of their engagement, LivingSocial also sent them on a two-night Virginia Beach trip. No word on how the other paintings came out.